Off-White-Fanciers now refer to this colour as Ruby-Eyed White. The new Grey locus nomenclature was quickly adopted by gerbil fanciers but apart from the early work that was undertaken by the geneticists, very little was known about this particular locus or its mutant allele other than its ability to drastically reduce phaeomelanin in the coat, while only marginally reducing eumelanin. However, with the recent discovery of a new recessive allelomorph on this locus, which when homozygous, removes most pigments from the coat and eye on both Agouti and non-agouti, it has now enabled us to possibly ascertain the true identity of the G locus. Around the year 2000, Michele Inman, a gerbil breeder from Illinois, U.S.A. bought several gerbils from a pet shop and it is from these foundation gerbils that Michelle first noticed, then eventually isolated the mutation. In late 2008 she contacted myself through the eGerbil website. Michelle had already done a great deal by test breeding the mutation on many known colours, and arrived at the conclusion that the mutation resided at our currently known Grey locus. 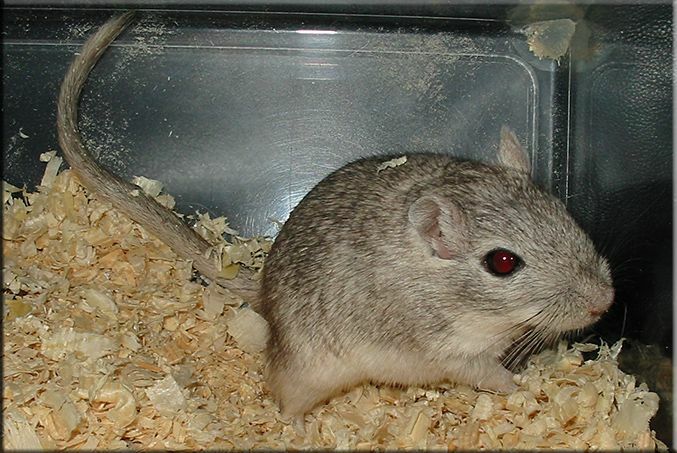 On both Agouti and non-agouti coat backgrounds, the new mutant gene when homozygous produces a cream gerbil with dark ruby eyes, The coat colour is very similar to the White–Bellied Cream and the Self Cream ( syn. C-separator/Red-Eyed Silver Nutmeg). A single recessive gene when combined with the existing Slate coat colour produces the colour Azure slate, which is a further dilution of Slate that lends to the coat a subtle bluish tone. Although it is superficially similar to the blue coat colour caused by the dilute gene, on closer examination it is quite different. When the gene is combined with extension of yellow ‘ee’ it produces an off-white gerbil with ruby eyes. The colour is similar to the known coat variety, Ruby-Eyed White. This new mutant, and the entire locus, mimic other known well known coat colour phenotypes. However the nature of its importance lies not in any new colours produced, but in how it enabled us to identify the true identity of the G locus. As mentioned in the research paper on the Grey mutant, there are only a few coat phenotypes in other species that resemble the chinchillated appearance of the Grey Agouti gerbil, and although these coat colours looked similar to the Grey Agouti, they differed in many other respects. Since that initial research, other grey mutants have arisen in mice that may have help shed some light on its true identity. To confirm that the mutant was indeed an allele of the Grey locus, I instructed Michelle to conduct some simple complementation tests for allelism. Once this was proven we could move to the next step which was researching existing mouse gene databases looking for coat colour comparisons of the mutant alleles. This in itself was quite a task as not only had we to find a coat colour that matched the new mutant, but also find another allele of the same locus that produced similar phenotypes to our well known Grey Agouti and Slate coat colours. My initial thoughts of the new mutant gene were that we were looking at some form of oculocutaneous albinism. Even though this form of albinism was disregarded in early research on the g gene (the g gene wasn’t an allele of the albino locus, so albinism was dismissed) there are several other types of coat and eye albinism, each having their own distinct phenotypes. Also, if one takes a much closer look at the grey gene we can actually observe slight OCA taking place. We can not only see a dilution of the coat, but a slight dilution of the eye. Although eye dilution is subtle, it becomes obvious on a non-agouti background, and especially so if you observe the eye under a bright light where it glows a very dark ruby. Obviously the two alleles, 'g(x)' and 'g' were similar, with 'g(x)' being severe in its actions , but we needed a match of phenotypes to a comparable locus in other species, if that was possible, so naturally we turned to the house mouse to hopefully find our answers. Our hunt for coat colour comparisons with mouse alleles gained momentum when our colleague Sandy Van Eysinga from the M.I.G. (Mutation Investigation Group) offered to help Michelle and me. Between the three of us we all clearly decided that one of the main candidates I initially drew up in a short list bore striking similarities to Michelle’s 'g(x)g(x)' gerbils which, over the years, Michelle had come to name “Satins”. In mice, this particular coat phenotype is known as underwhite, and it essentially bleaches the coat of the animal to a cream/beige colour and the eyes to a dark ruby. However there was virtually no information available as to whether this locus had other mutated allelomorphs or what the phenotypes of these alleles looked like. After several fruitless months searching various research papers, luck was finally on our side when I was reading through a paper about two further alleles on the underwhite locus. These mutant alleles were known as underwhite dense and Underwhite dominant brown. Although I initially ruled out dominant brown because it was a semi-dominant over the wild type allele, the underwhite dense in the study sounded very similar to our slate coat colour variety. I should explain here that most studies on underwhite and its various mutated alleles are normally carried out on a non-agouti background, and finding breeding data on Agouti was non-existant! However we desperately needed to know what the coat colour looked like on an agouti background! because without this confirmation everything was still guesswork. Further in to the research paper, the authors gave out some important data on uw(d) on Agouti, and this helped us ascertain what its coat colour phenotype looked like. Also within the paper it contained breeding studies conducted on the effects of uw(d) (non-agouti) when combined with recessive yellow and pink-eyed dilution, this too gave us further insights on the gene and helped draw parallels to the grey allele in the Mongolian gerbil. You can download a copy of this research paper in pdf format from here. “The Underwhite (uw) Locus Acts Autonomously and Reduces the Production of Melanin”- Anne L. Lehman, Willys K. Silvers, Neelu Puri, Kasumasa Wakamatsu, Shosuke Ito, Murray H. Brilliant. 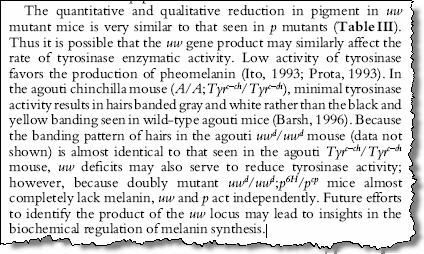 As you can read from the extract here, it seems that the underwhite dense mutation on an agouti mouse closely resembles the chinchilla mouse coat colour. The studies conducted in this research paper may have helped the gerbil community to identify the existing grey mutation as underwhite dense and identified Michelle Inman’s mutation that she has worked on since 2000 as underwhite. It has also helped resolve the issues regarding the identity and also the possible function of the G locus in the Mongolian gerbil.